Carlsberg were wishing to have a bar table that they can give away to their distributors and on festivals. They were looking for a simple, yet at the same time attractive design. The bar table that we have created was a very effective type of advertising as it had multiple purposes of use. The table also had an umbrella nest, which is especially needed in both sunny and rainy weather conditions. 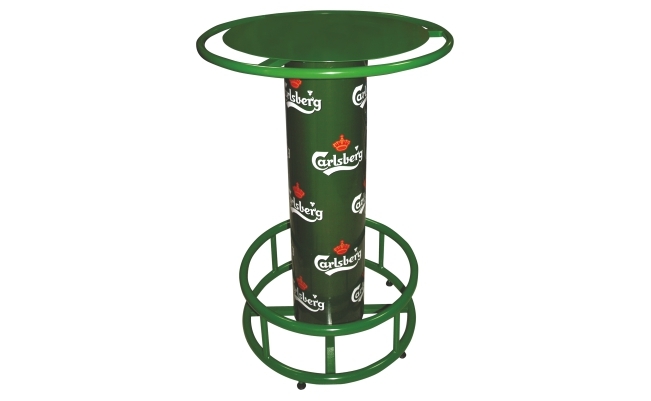 The product was manufactured from solid metal, which gave Carlsberg an effective advertising for years ahead.